Teaching Experience: More than 12 years. 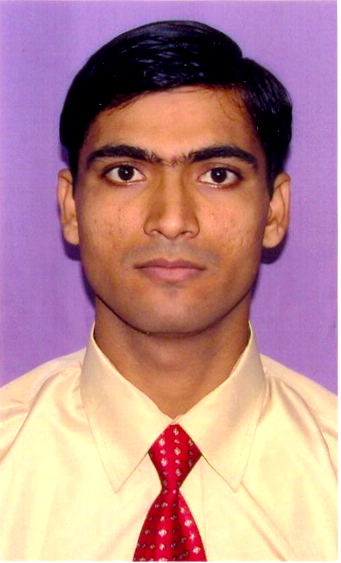 At present serving as asst Prof. in Department of Zoology, Govt. PG College, Bisalpur Pilibhit (U.P.) since 1st February 2006. Orientation Programme: earned from UGC-ASC, Kumaun University, Nainital (14th June-11th July 2008). Analysis Of Essential Amino Acid Contents In Forager Bees of Apis Mellifera L. Fed On Artificial Diets. Acta Biomedica Scientia Vol 3(1): 58-62, Kumar S. 2016 e - ISSN - 2348 - 2168 Print ISSN - 2348 - 215X. Effect of Malathion on Amino Acids Contents of Worker bees of Apis mellifera L. Proceedings National Conference, Govt PG College, Bisalpur, Pilibhit pp 149-153. Kumar S. and Yadav H. 2012 ISBN: 978-93-5067-884-8. Present Strategies for Rural Development in India 2014. The Role of Education, Research and Technology in Rural Development pp 81-86. Kumar S. and Yadav H. 2014. ISBN: 978-93-5174-4986. Role of ICT in Higher Education 2014. The Role of Education, Research and Technology in Rural Development pp 71-76. ISBN: 978-93-51744-98-6. Challenges of Skill Development in Educational Institutes in India. Proceedings of National seminar “Unemployment and skill development of rural youth in Educational Institutions”. pp 42. Kumar S. and Yadav H. 2015. ISBN : 978-93-51744-99-3. National Seminar organized by Zoology department, J. N. V. University, Jodhpur and Nature conservators (India), Muzaffarnagar on Feb. 2, 2004, was attended to deliver oral presentation of research paper “Determination of Acetyl cholinesterase activity in Adult honeybee and broods of Italian honeybee A. mellifera (2003)”. National conference organized by Zoology department, Institute of Science, Bombay (22-24 Nov 2004) was attended to participate in BRPM competition. National Seminar onAccess & Equity Vs. Quality and Relevance in Higher Education & Twelfth Convention of U.P. Govt. Colleges Academic Society (13-14, Jan., 2007) organized by Govt (Raza) PG College Rampur. 95th Indian Science Congress held at Andhra University (Visakhapatnam) (3-7 January, 2008) was attended. National Seminar on Bioresource Management and Global Sustainability (17-18 Dec 2011) organized by MP Govt PG College, Hardoi. National Seminar on Resource Management in Higher Education institutions in India (21-22 Jan 2012) organized by Dr Ram Manohar Lohia Govt Degree College Aonla, Bareilly. National seminar on Challenges & Road Ahead: A Macro-cosmic Analysis of Sustainable Development (Feb 1-2, 2014) organized by VRAL Govt Mahila Degree College, Bareilly, UP. National Seminar on Indian Society and Culture in Global Prospect (15-16 Feb. 2014) organized by Govt Degree College, Badaun. National Conference on The Role of Education, Research and Technology in Rural Development (22-24 Feb. 2014) organized by Govt PG College, Bisalpur, Pilibhit UP. National Conference on “Unemployment and Skill Development of Rural Youth in Educational Institutions” (Feb. 21-22, 2015) organized by Govt PG College, Bisalpur, Pilibhit UP. National Conference on “Environmental Issues for Socio-ecological Development” (Feb. 25-26), 2015 held at Department of Botany, Bareilly College, Bareilly. National Seminar on “Development, Evironment and Society: Changes, Challenges, Remedies” (Mar. 19-20, 2015) organized by Dr. RML Govt Degree College, Aonla, Bareilly, UP. National Seminar on Environmental Protection through Innovative Approaches for Sustainable Development (27-28 Jan 2016) organized by Khandelwal College of Management Science and Technology, Bareilly. National Seminar on “New Education Policy: Vision and Aspirations” (Feb. 22-23, 2016) organized by VRAL Govt Mahila Degree College, Bareilly, UP. National Conference on “New Education Policy: Vision and Dimensions” (Mar. 27-28, 2016) organized by Govt PG College, Bisalpur, Pilibhit UP. PROJECT: Project work is done with B.Sc. I II and III year Students including syllabus based activities. Field Study: Students are encouraged to do field study by visiting locally situated Apiaries, Fish culture sites, insect collection etc under supervision of Department. Life time member Nature Conservators society Since 2008. STUDENT’S GRIEVENCE CELL ” I CARE, I DARE”…..solving students queries, career counselling, competitive skills, inculcating moral values in them, guidance for life skills, informing about Power Angels and women helpline 1090 to girl students. Also provide a platform to the students for sharing their innovative ideas and develop a decision-making capacity.